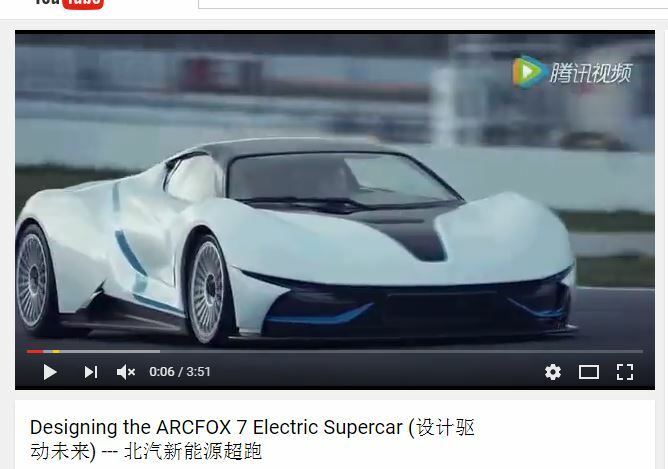 Say hello to the BAIC (Beijing Automotive Industry Holding Co) Arcfox-7. Whether or not you were ready for another electric supercar, this groundbreaking new vehicle is in fact expected to go on sale in China later this year. The Arcfox-7 is powered by a 6.6kWh battery pack connected to a 603HP electric motor. With a hefty weight of 1755kg (3,869 lbs), it can reportedly do 0 to 100 Km/h (62 mph) in less than 3 seconds and achieve a maximum top speed of 260 Km/h (162 mph). All of this wrapped up in one of the interesting looking designs to ever conquer the track (and our imagination’s imagination). This vehicle took heavy inspiration from the single-seat vehicles of the Formula E (electric motorsports) race cars. So in keeping pace with those high speed racers of the “electrifying” competition variety, this car is another battery-powered performance marvel. That marvel includes its formidable braking power. The Arcfox-7 uses six-piston calipers at the front, and four piston calipers at the rear with both mounted on ceramic brakes. Together those factors actually could signal the car’s true abilities on a track. Even with all of this performance-oriented power, drivers will still be able to access it on the 299 Km (186 miles) autonomy. Now, compared with the business standard that is significantly low. But then again, few engineers would risk combining blistering performance with trumping Tesla’s 508 Km (316 mile) range. China’s auto industry has had the misfortune of a reputation for Euro-clones and strange extended-wheelbase versions of regular cars like the Jaguar XF L but this year alone China has also come up with some genuinely unique and intriguing new stuff at every international auto show. To be many of their cars, namely the LeEco and the LeSEE are pure Tesla-but with the Arcfox-7 we’ve seen odder cars things knocking about in Beijing’s show halls. I mean, the Arcfox-7 essentially looks like environmentally friendly baby of an Aston Martin and Ferrari. And it looks great on the inside too. With a snug cabin formed from ‘recyclable, biodegradable, environmentally-friendly materials’ (AutoBlog), is also features full-on next-gen tech including fingerprint recognition and infotainment systems. Also at the ready is the Arcfox 1; which is kind of a silly looking small convertible EV concept. The Arcfox-1 is kind of slabby, and it’s this weird tiny urban SUV convertible that is equal parts appalling and brilliant. Like it’s big brother, it’s a fully EV and it features a roll-hoop that is described in the press material as ‘creative’ and wheels that look ‘very personal’ (MotorTrend). “Made In China.” That’s a typical American joke but as far as we can see, there’s really some genuinely amazing stuff coming from China – and that’s no joke.